If you are searching for information on finding a school for makeup or looking for more information on becoming a makeup artist, you have come to the right place. Below you will find general information and frequently asked questions about finding the right makeup artist school for you. Thinking about enrolling in makeup school? How do I find and contact Makeup Schools? I know how to put on makeup. Why do I need makeup artist training? How Do I Choose Makeup Training That Can Lead To A Lasting Career? How Can We Help You Promote Your Makeup Career? What Else Do You Need To Know About Makeup Artistry? What Do You Learn In Makeup School? What makeup classes can I expect to take? Does each makeup school teach the same curriculum? Are there advanced or master level makeup courses? How much does makeup school cost? If you are ready to learn how to become a makeup artist, we have what you need. For years, we’ve made it our mission to help students work towards careers in the beauty industry. Some studenst interested in beomcming a makeup artist may need to take a cosmetology or esthetician program to work professionally in their state. Other may only need to take makeup classes for a license in their state. You might even find makeup artist online courses you can take. In the sections below, we have information different kinds of professional makeup careers you can pursue. But, let’s begin with some data that is helpful to think about at when comparing makeup artist school options. Whether you are looking for general information about makeup classes and makeup artist programs, finding the closest makeup artist school near you, or have questions about what you learn in makeup school, you will find the information to get you started. Your state, the type of work you do, your skill level and other factors can determine your level of success in makeup artistry. For instance, the Bureau of Labor Statistics (BLS) reports that makeup artists who work in the motion picture industry earn an average salary or $83,580 per year (2017). Those who work for performing arts companies can earn around $62,230 a year (2017). Now, most makeup artists work in personal care services positions. In these roles, you can expect to earn around $28,770 per year as a makeup artist. Those who fall right in the middle make an average wage of $53,230 per year (2017). The top five states for makeup employment levels are: California, New York, Texas, Florida, and Georgia. While there is some range in what makeup artists can make nationally, most of the salary levels in these states are on the high end of the spectrum. As an example, in California, makeup artists earn an average wage of $78,280 per year. In Texas, the third highest employing state, the average wage is $47,150. While Georgia, at the bottom of the top 5, pays its makeup artists an average wage of $53,060. If you recently decided to learn makeup, you might not realize how many types of makeup artist jobs there are. That’s because there are so many industries that rely on film/TV or performance makeup. Advertising and modeling are two industries that use makeup artists to enhance their aesthetics. And there are many occasions, such as weddings, where makeup artists are needed to enhance the main characters. When you speak with schools, you should ask what type of career their professional makeup program is geared towards. While you may find it fairly easy to find programs that teach you bridal, seasonal, and basic film/TV makeup, you may have to dig deeper for specialized programs. For instance, a special effects makeup program can give you an entire area of focus that is career oriented. But that’s because the world of special effects makeup is highly complicated, and allows for a wide range of artistic freedom. If you dream about preparing models for the catwalk, this career path is for you. This type of makeup artistry also encompasses those who work at bridal boutiques, at retail sales counters, in corporate headshot photography and other cosmetics related areas. These types of jobs can be found in many major cities, as well as in less populated areas. 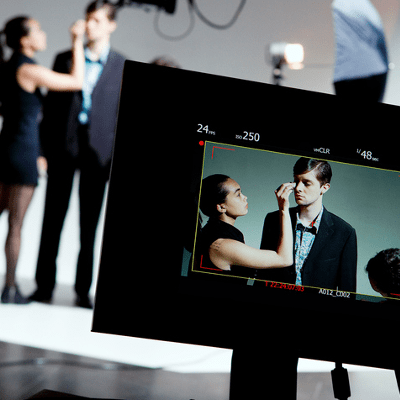 Whether you want to work in Hollywood, Broadway, Chicago, or your hometown theater, many makeup programs can prepare you for this line of work. This can also include working for television stations, or on local film productions for businesses, advertising, and small budget productions. This is one area you really don’t hear about that often. However, there is a need for makeup professionals in clinical settings. These professionals work in dermatologists’ offices, hospitals, plastic surgery setters, and other facilities that help patients recover from health challenges. Some of these artists use medical grade makeup to help clients/patients hide bigger skin issues. Patients who are physically unable to apply their own makeup often seek permanent makeup solutions. When you look into makeup artist certification classes, consider permanent makeup programs as an option as well. If you are considering enrolling in makeup artist training, you are probably curious about how much the program costs, how long it will take to complete, what you will learn in the program, and more. Beauty Schools Directory has answered many of the most common questions about the education that helps you become a licensed makeup artist (MUA), so you can decide whether taking the next step in your career is the right decision for you. If you think training to become a makeup artist sounds like the right fit for you, just enter your zip code in the box. Choose "Make-Up Artist Training" as your program to find schools near you that offer this program. The first step to becoming a professional makeup artist is to get the education and get licensed, if applicable in your state. If you're considering becoming a cosmetics professional, talk to makeup schoolsabout their programs, the cost of tuition at their campus, curriculum and any other questions you have. Everyone learns a little differently and has slightly different priorities when it comes to choosing the right college, so we created this handy step-by-step How to Choose a Beauty School checklistto help. We advise you to talk to a number of different campuses near you and get all your questions answered, so you can make a confident decision on which makeup college will best meet your needs and set you up for success. We find that the average student considers 3 to 5 schools before making a final choice, but because makeup is a highly specialized program and not every state offers licensure in this field, the number of options may be smaller. It's an important life decision that should be considered with care after comparing your school options. Makeup schools nationwide are enrolling now! Many people think that transitioning from a makeup enthusiast into a professional makeup artist is an easy feat. However, as those in the makeup industry will be quick to tell you, a formal education from an academy of makeup can make the difference between a hobby and a real profession. Quality makeup training from a makeup artist school is not only important but essential if you plan on making a career of this interest. Makeup artist schools provide students with a more extensive variety of skills that are difficult to master at a higher professional level on one's own. As your education progresses, you will most likely zero in on a particular area of professional makeup application, and can build up your portfolio for eventual placement in this field. Also, it is very different to choose and apply makeup on your own face compared to selecting a color palette, the right products and applying makeup on your clients. Proper training can make a huge difference. All that said, some states do not require official certifications or licenses to perform makeup services professionally. However, classes are likely still available to become an expert at your profession and set yourself apart from your competitors. Clients expect nothing but the best from their MUAs, so make sure you get the education and training to back up your skills. The first thing you should do when considering a makeup career is check with your State Board of Cosmetology. They will be able to tell you what kind of license you need-which is extremely important. As we noted earlier, some states do not regulate makeup while others do. When you speak with makeup artist schools, simply ask if their program meets state requirements. After all, it doesn’t matter what curriculum they offer, if you can’t qualify for the appropriate licensure. From there, steer the conversation toward career outcomes. Go through the course outline thoroughly and make sure they match your career aspirations. Professional makeup programs can differ greatly in duration, cost, financial aid options and learning outcomes. You might even find a makeup artist school online, just make sure it meets your state’s standards. If you have to choose between a cosmetology or esthetician program for licensure, be sure you understand the difference. In a cosmetology program, you will learn about hair, skin, nails, and makeup. Esthetician programs focus on skincare, makeup, and facial science. With this type of education, you can also qualify for work in dermatology offices, or in a salon performing facial services. See how much your choice for training can impact your career and open doors of opportunity? That’s why it’s essential to choose wisely! We recommend making a LinkedIn profile for your online resume while you are in school. This is a great place to network with other makeup and cosmetology professionals. In fact, there are over 70 groups dedicated to beauty careers. To get some ideas for your profile, take a look at the top cosmetology profiles, according to the social network’s data. You should also document and share your makeup skills on Instagram. This social channel is made for careers in the world of beauty. People love looking at hair, makeup, nail artistry, and other cosmetology related posts. That’s why individuals and salons are rockin’ their Instagram game to attract followers and impress potential clients. It’s also a great way to show off your personality, which employers will consider, along with your skills. We’ve got accounts on all the platforms and would love to help share your talents, so don’t forget to tag us in your posts! You probably have a million questions right now – so get excited! (And don’t forget to write them down, and review our FAQ’s.) We can help you find makeup artist certification classes without getting dizzy. Simply use the search tools on this page to view your options for makeup artist school training. And once you learn makeup and start showing off your makeup skills to the world, let us know about your success! Many schools are dedicated solely to makeup or have specific makeup programs, but most often makeup artist certification is learned as a part of a comprehensive cosmetology training program. If your state licenses makeup artists, there may be a standard curriculum of courses and skills that your school is expected to cover. These may include core classes like safety and sanitation, business ethics and marketing yourself, or makeup-specific classes like color theory, product selection, application techniques, and so on. However, if your state does not have certifications or licenses for this profession, you may find a wider range of course options and a less structured curriculum that dive deeper into specialized areas of makeup. Also, some states require makeup artists to be licensed under the Cosmetology or Esthetics licenses, which have a slightly longer curriculum and include a variety of other related skills and classes. If you're trying to decide which makeup artist school in the U.S. is the best for you, ask yourself these questions: What about being a makeup artist interests you most? What setting would you like to work in? Are you passionate about a particular type of makeup, such as wedding, theater, broadcast or special effects makeup? Be sure to ask your different school options about what programs they offer in their curriculum to see whether any of the schools offer the particular classes you want, or if it’s something you learn on your own after learning the foundation and basics at school. Definitely! Even if your state does not require continuing education to renew your certification, Beauty Schools Directory always recommends taking continuing education hours throughout your career to stay current in the industry and up-to-date on the latest cosmetics products and application techniques. Often these continuing education hours come in the form of single-day or weekend workshops, special seminars or conference-based trainings. Many makeup artists get their foundational training at a standard makeup school, and then as their careers grow and evolve, they seek out advanced or master-level makeup classes to heighten their skills and abilities in the field. This is often the time when MUAs decide to choose a specialty area, and pursue as much additional training in that field as possible. The cost of tuition for makeup schools can range depending on the courses in the curriculum, hours of instruction required by your state, as well as location, facilities, and equipment required to purchase for your program. Because of the cost of business facilities, cosmetics artist training programs inside or close to major metropolitan cities like New York, NY, Los Angeles or Chicago will likely cost a little more, whereas smaller, more rural areas or suburbs that may be accessible with a bit of a commute may be cheaper – however makeup artist training schools may be harder to come by in smaller cities or non-coastal areas. For each makeup school you're interested in, be sure to ask admissions reps what their tuition costs are and what exactly this costs includes – such as textbooks, makeup kits and brushes, cosmetic products, and so on.